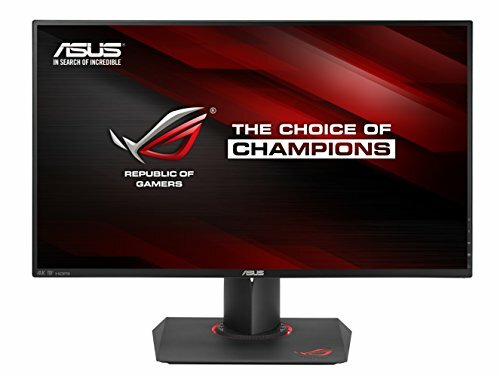 Asus has one of the widest ranges of adaptive-sync displays on the market, catering for both C-Sync and FreeSync, for users of Nvidia and AMD CPUs respectively. Their general high quality has impressed us in previous reviews, and they’ve also come packed with features, including flexible stands that pivot, rotate and tilt, as well as great on-screen display software, controlled by a small joystick at the rear of the display. The ROG Swift PC27AQ breaks new ground, though, being a 27in G-Sync display with an IPS panel and a low 4ms response time. As such, you can expect superior image quality and viewing angles compared with your average TN panel, but without the severe ghosting problems of some older IPS monitors. What ‘s more, it has a native 4K resolution and supports G-Sync up to 60Hz. While it isn’t the first IPS adaptive-sync display we’ve seen, or the first 4K monitor with G-Sync, if s the first screen we’ve seen that offers all three. While Acer’s XB280HK 4K also features G-Sync, for example, that display has a TN panel rather than IPS. The vast majority of alternative G-Sync screens also have a 2,560 x 1,440 native resolution, but can go up to 144Hz. This higher refresh rate isn’t possible at 4K due to the required bandwidth, which exceeds the capability of Display Port 1.2. Faster panels will have to wait for a new Display Port standard, which will only be possible with new graphics cards as well. Until now, all G-Sync displays have been limited to a single Display Port input, unlike FreeSync monitors. Asus has added a secondary HDMI port to the PG27AQ, though, meaning you can connect a games console to it, or a second PC, although it’s only HDM11.4, so you won’t be able to display 4K resolutions at 60Hz from it, or use G-Sync. There are a few other omissions as well. Nvidia’s 3D Vision technology has been cut, as has ULMB (ultra-low motion blur). There’s also some artificial segmentation on the part of Asus. The PG27AQ is absolutely aimed at gamers, so it therefore offers plenty of features gamers might want, but a few other features that are generally quite common on cheaper displays have been deliberately removed. Multiple gamma settings is one example. The screen is set to 6.500K, and you can’t change it. If s easy to understand why. Gamers probably don’t adjust the gamma much, and that feature might be better suited to a graphic designer or photographer. But what about photographers who also enjoy gaming? When spending this much on a display, it would be ideal to have as much picture control as possible, even if those features aren’t going to be used by everyone. However, that isn’t to say the OSD is light on features. It has six Game Visual image presets, as well as controls for colour temperature, saturation, brightness and contrast There’s also a crosshair to help you ‘cheat’ in FPS games and a useful on-screen fps counter. With G-Sync enabled, the display’s frame rate is locked to your graphics card, so this readout is accurate, at least up to 60fps. The OSD is a joy to use too. The joystick at the back offers a great way to quickly navigate through the menus, and Asus has put thought into where the settings have been placed. The most common ones have their own menus while the more specialist settings are found in a larger menu at the end, which makes sense. In games and on the Windows desktop, the picture quality of the PG27AQ is excellent. We tested it with a Spyder 4 Colorimeter, and measured brightness of 297cd/m2, roughly matching Asus’ 300cd/m2 claim. It isn’t the brightest display, but you don’t notice it at all in use. The panel quality is generally brilliant, with an out-of-the-box delta E under 1, a 550:1 contrast ratio, 100 per cent sRGB coverage and 80 per cent Adobe RGB coverage – a great result. What’s more, the monitor performed negligibly better after full calibration, so the out-of-the-box performance is superb. The brightness uniformity wasn’t up to the standard of some displays for professional-level photography though. Our results showed deviation between 6-18 per cent, but that’s not really important for a gaming monitor. What matters is games performance, and the tear-free G-Sync effect when playing a few intense rounds of Battlefield 4 multiplayer made the PG27AQ superior to any 4 K display without adaptive-sync tech. It might not be able to manage the 144Hz G-Sync gaming of lower-resolution screens, but with current technology and standards, the PG27AQ is as good as it gets for 4K adaptive-sync gaming. Although it isn’t perfect, the PG27AQ is the best 4K gaming display around, with a great picture, excellent OSD and G-Sync support. While it has an excellent panel, though, it isn’t as useful for pro-graphics work as it is for gaming. The lack of a 144Hz refresh rate is also notable, but few people have a PC that can handle such frame rates at 4K with maximum detail anyway. In short, if you’re looking to make the leap to 4K for gaming and have an Nvidia GPU setup, the Asus ROG Swift PG27AQ is as good as it gets. The absolute best 4K gaming monitor we’ve tested. It has a few limitations, but if you’re looking for a G-Sync-; friendly 4k monitor, the PG27AQ is as good as it gets. 4K/UHD 27" IPS panel delivers superior resolution and color, maximizing immersion while eliminating the need for anti-aliasing in games.